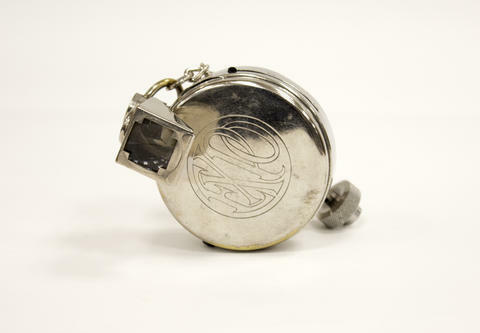 Disguised as a railroad pocket watch. Takes picture through the winding stem, which the winding knob serves as a lens cap. Special cartridges. This is an interesting camera, but actually quite common since it was marketed for so long. Several variations exist in the "Expo" trademark style, the winding knob, and the viewfinder shape. Black, red, blue enameled versions produced about 1935, rare. With original box, triangular viewfinder, lens cap is missing.